I’ve been looking through the site recently and looking for what types of recipes or ingredients aren’t represented very well. Like, in my last post, I finally got another pistachio recipe up (yay! 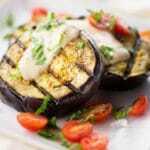 ), and today, I wanted to share a new eggplant recipe. Woot! Because (1) eggplant is awesome, (2) I love eggplant parmesan, and (3) eggplant is in season RIGHT now. 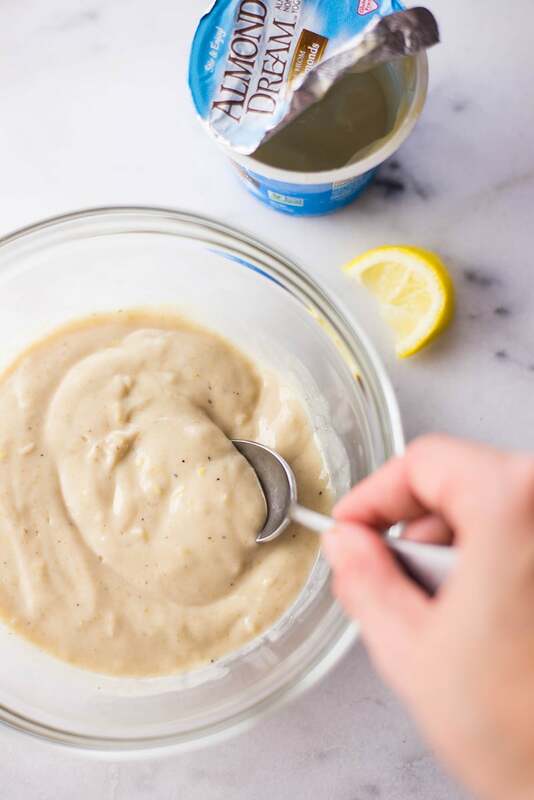 Plus many of you have been asking for vegan and/or non-dairy recipes so this seemed like the perfect opportunity to share one for ya. Double woot! Even though I don’t currently follow a vegan or non-dairy lifestyle, I had to remove dairy when I was pregnant with Hunter which, I found, was a real struggle. Fortunately, learned there are tasty options like Almond Dream who make it possible to enjoy yogurt and still avoid dairy. So. 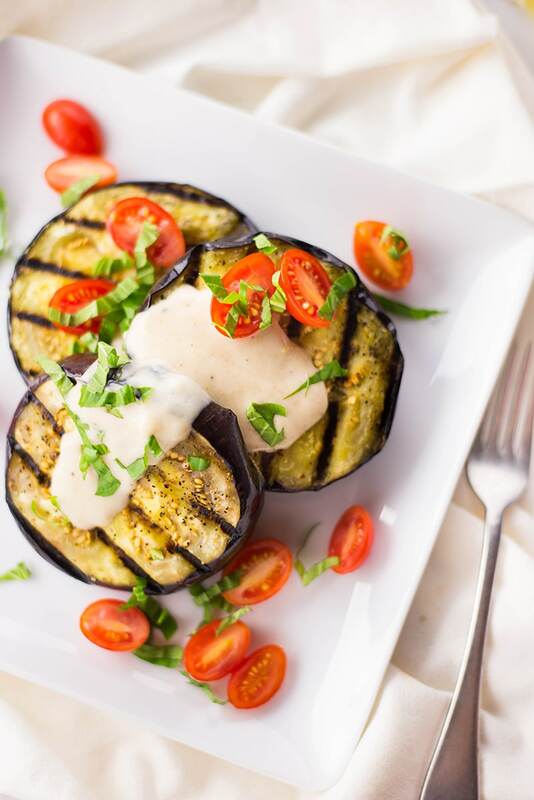 Let’s discuss this grilled eggplant recipe we’ve got right here. First off: it’s incredibly easy to make. I use my indoor cast iron grill, but it also works perfectly on an outdoor grill. If you’ve never grilled eggplant before, besides eggplant parmesan, it’s my FAVE way to prepare eggplant. It’s super fast, easy, and full of flavor. Next, you can make this recipe from start to finish in less than 30 minutes, and even make extra for entertaining or just to store for later. I know. I love easy, healthy, and fresh recipes that look impressive, but couldn’t be easier. Summer grillin’ is where it’s at right now, peeps. 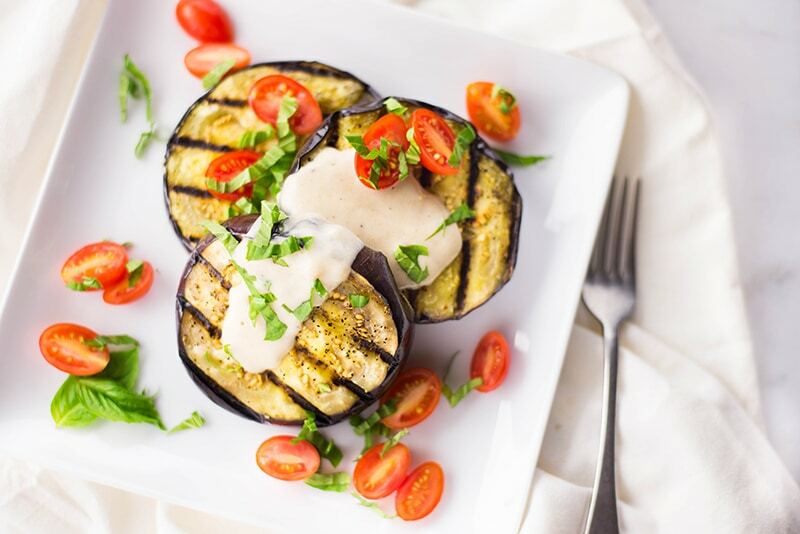 Now, you have an eggplant recipe that’s yummy, vegan, and easy to boot! 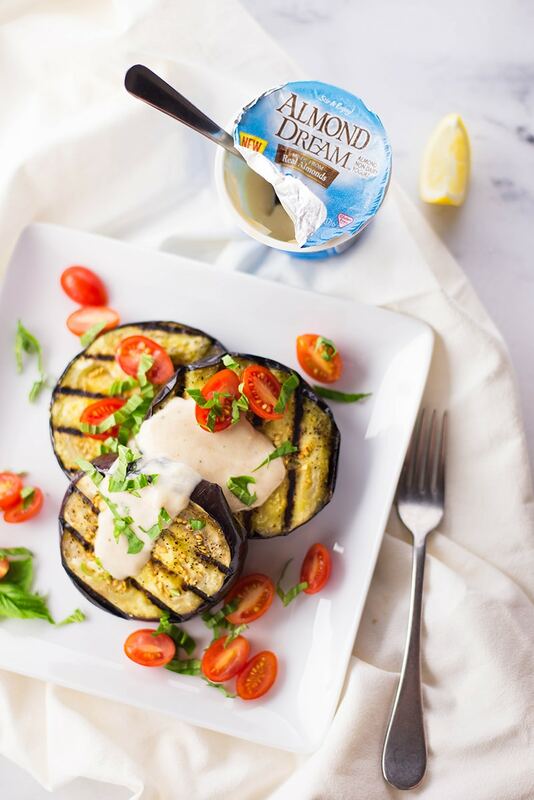 This Grilled Eggplant With Tahini Yogurt Sauce is the perfect vegan appetizer for summer. 1 large eggplant approx. 1 lb. Remove both ends of the eggplant and slice into 1/2 inch slices. 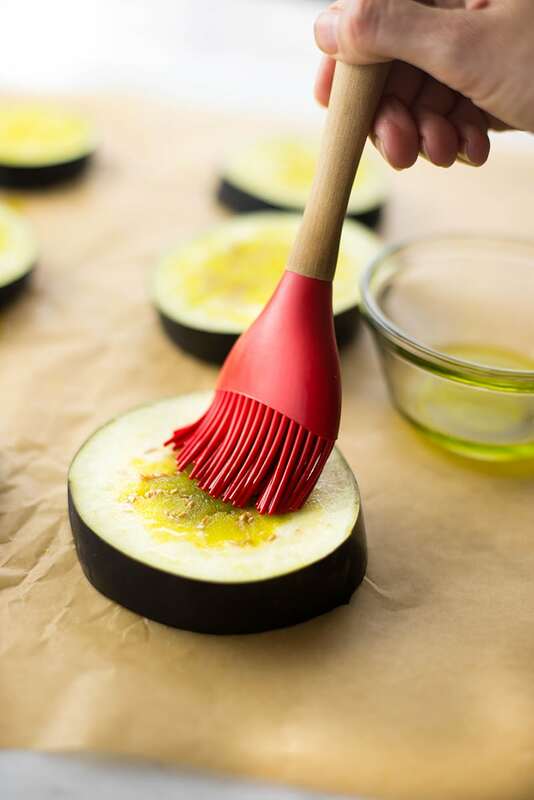 Brush both sides of the eggplant slices with olive oil and then lightly season with sea salt and ground black pepper. 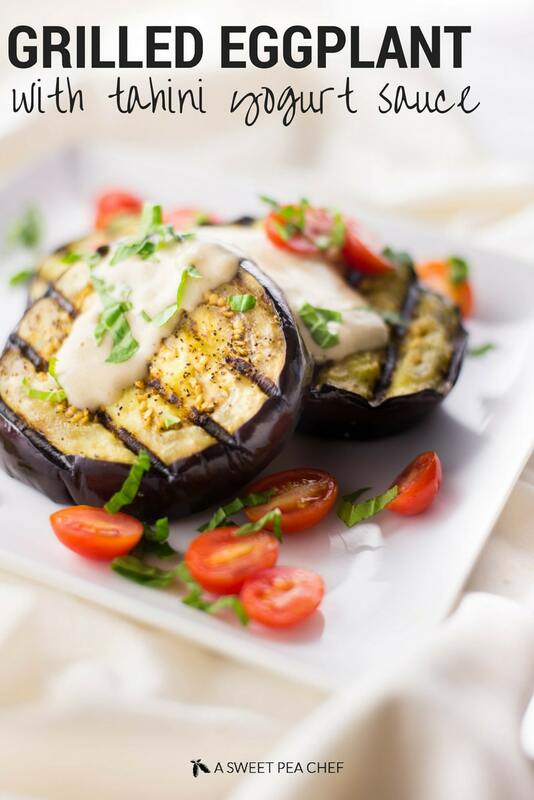 Heat either an outdoor grill or a cast iron indoor grill to medium-high and grill the eggplant until dark golden-brown grill marks form. This should take approx. 3 to 4 minutes per side - we’re looking for the inside to be grayish and soft, not white and hard. 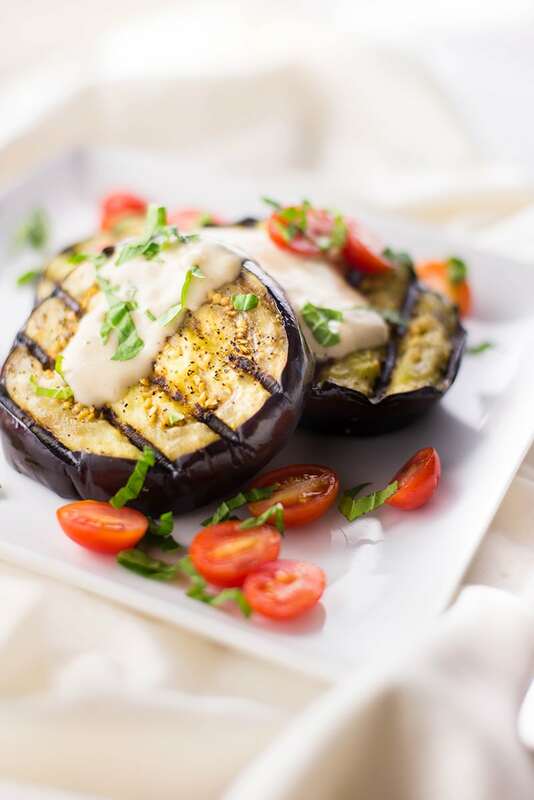 To serve, place a dollop of the tahini yogurt sauce over the grilled eggplant, followed by a handful of sliced grape tomatoes and fresh basil.